Read this white paper for an overview of the high-level network architecture, then dive into the details and requirements around the automated deployment of Corda nodes—Java virtual machine runtimes with a unique network identity running the open source Corda blockchain software. 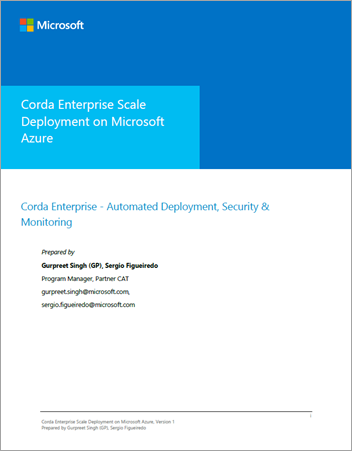 Deploy the Corda Enterprise node on Azure. Integrate the Corda node with Azure Key Vault. Provision the Corda node to the Corda TestNet. Manage monitoring and telemetry on Azure.